Ensuring that customers are happy with your business is an important key to business success. Not only are dissatisfied customers not likely to come back, they are also likely to say negative things to other people that will keep them from doing business from you to start with. Satisfied customers might return, but it's the ones that are truly happy with your organization who truly become loyal. 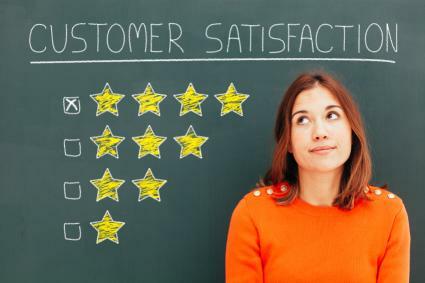 Making customers happy isn't about having a 'the customer is always right' philosophy. That approach actually leads to an 'us' versus 'them' mindset that can backfire. Providing exceptional customer service isn't about someone being right and someone being wrong. It is about doing everything within your power to ensure that customers' needs are met. Real customer service boils down to knowing what customers need and expect - and making sure that those needs and expectations are met. In order to have happy customers, you must first provide products or services that perform as promised - and that is where the idea of quality comes in. According to QualityDigest, one way to define quality is simply "meeting the customer's needs in a way that exceeds the customer's expectations." When you meet customer needs and expectations, you will have satisfied customers - and this should be a minimum acceptable threshold for any business. To provide truly exceptional customer service, however, you must not stop with just meeting needs. Exceptional service providers focus on exceeding expectations. When your approach to customer service is focused on exceeding expectations, you are making it possible for customers to cross the line from being just satisfied to being truly happy - and that is where customer loyalty comes from. Service providers must sometimes manage customer expectations so they are realistic. If you lead customers to believe that your product or service can deliver more than it really can, that sets the stage for customer dissatisfaction. In order to provide effective customer service, it is often necessary to help educate customers about what they can realistically expect. As pointed out on the Client Heartbeat blog, "There's nothing worse than over-promising and under-delivering!" It is always better to do the opposite - under promise and over deliver. A customer who is pleasantly surprised by an unexpected positive outcome is much happier than one who gets less than she was promised - or allowed to believe that she would receive. Companies - and their employees - must take responsibility for customer service. The notion that customer service is only the responsibility of a particular person or a specific department is one that needs to dispelled. It is a simple fact that customer service is everyone's job. When customers do business with your company, they are doing business with the organization as a whole. The individuals they interact with are representatives of the company, and the words and actions of every company representative impact their overall perceptions and customer experience. Get your employees in the habit of thinking 'it is my responsibility to find a solution' as opposed to worrying about whether or not a specific request falls in their job description - and give them the authority to do so. It may not be your accountant's job to fix a broken part - but, if a customer asks for help, your accountant can direct the customer to the best person or department to handle her request. It's also important to note that sometimes customers just want a simple apology. Even if the company didn't do anything wrong, it's always okay to say something like "I apologize for your frustration" or "I am so sorry you are having this experience." Rational factors aren't the only ones that impact consumer's decision-making process. According to Communico, emotional factors have an impact of greater than 50 percent on most buying decisions. An article on the company's website states, "Emotions shape the attitudes that drive decisions and behavior. And, they impact behavior far more than technical or functional factors." According to Communico, keys to creating an emotional connection starts with ensuring that everything you do - from the messages you deliver to your employees to your company's overall processes - are designed with the customer as their central focus. When you communicate with employees about their responsibilities, do so in terms of how their actions impact customers. When establishing procedures, consider how the process will seem to customers. This will better allow you to consistently show respect for customers and be responsive to their needs. By putting your customers at the center of everything, you'll begin the process of creating strong emotional ties with customers. Communicating effectively with your customers involves both providing and taking in information. What you say to customers matters, as does how you say it - but listening to them is just as important, maybe even more so. It is definitely important to choose your words carefully, choosing customer focused language and an appropriate tone. For example, focus on how your products and services meet the customers' needs, de-emphasizing a focus on yourself or your company to avoid coming across as self-serving or self-centered. Listening to customers requires really paying attention to what your customers are saying - not just letting them talk, but really attending to their words and nonverbal messages. As CSM, an online magazine for customer service professionals points out, "hearing is not the same as listening; in other words, receiving sounds is not the same as paying attention to them." Effective listening involves taking the time to make sure you really understand customers' perspectives, soliciting feedback from them, and responding appropriately. Customers are happiest with service provides who are responsive to their needs. The advent of social media has increased customer expectations for responsiveness, and companies have to adapt. Now that customers can reach out (or vent) via so many social media outlets, companies have to be proactive in monitoring and responding to concerns shared in this way. According to the Get Satisfaction blog, customers "expect a response from you every time they reach out to you in any channel they choose...quickly." Get Satisfaction advises businesses to "keep this manageable by only having a presence on as many channels as you can reasonably monitor." Further, social conversations with customers should be made available to other customers as appropriate. It's also important to treat customer service via social media as you would face-to-face or telephone communication. Respond each time customers initiate a conversation, being sure to follow up throughout until resolution is achieved. While specific customer service approaches can vary significantly from one industry to another, and even among different companies within the same industry, it can be beneficial to consider overall best practices when looking for ways to improve your own approach to customer service. Since customer service is about knowing what customers need and expect, there are definitely some commonalities with what works across business types. Provide a comfortable atmosphere, taking into account the impact of lighting, music, decor, cleanliness and temperature. Offer polite service with a smile without crossing over boundaries. Servers should never touch customers, sit at their tables or make negative remarks about other customers or co-workers. Provide an appropriate level of attention, checking in periodically and providing refills without being asked, but without hovering or interrupting guest conversations. Servers should exhibit teamwork, being proactive in meeting the needs of guests who require assistance, regardless of who their station is assigned to. If a customer asks something that you don't know, don't leave them hanging. Instead, tell them that you will find out - and follow through. When customers ask where things are, don't just point them in the right direction. Show them the way, by taking them there yourself. Avoid judging customers based on how they are dressed or other personal characteristics. The casual customer you ignore just might have plenty of money to spend - and she'll take it somewhere else if you aren't responsive to her needs. Reinforce purchase decisions by complimenting customers on their choices, providing interesting facts about their items to solidify their commitment to their purchases. Stay in touch with customers after job completion via hand-written thank you notes, follow-up calls a few weeks after delivery, periodic newsletters, etc. Avoid complacency. The fact that a customer has been with you for a long term doesn't mean they will always stay with you. The decision-maker may change at any time, and new competitors may be work harder to get their business than you are at keeping it. Focus on earning customers' business every time you have an opportunity to serve. Reward your best customers using special loyalty programs designed with the needs of business customers in mind. Rewards may include rewards points for purchases, exclusive discount opportunities, advance access to new products or sale pricing, dedicated client service teams and more. Utilize information technology systems, such as CRM programs, that make it easier to collaborate with customers for planning, replenishment and other key service elements that can help cultivate long-term relationships. This type of technology can be the key to long term customer relationship management. Despite all your best efforts to provide exceptional customer service, problems will sometimes arise. When you are dealing with a difficult customer situation, there are a few important tips to keep in mind. Do not personalize customer anger. When customers are angry with the company, that often translates into a difficult customer situation that you have to deal with. They know they won't get their concerns met by yelling at the building your company is in, so they sometimes yell at employees. Angry customers who raise their voices may not even realistically think that they'll get their concerns met by yelling at you - but they often try. As a service provider, sometimes your job is to be a "shock absorber" - allowing people to vent/have their say, so that progress can be made. When customers are upset, it is only natural for them to feel the need to vent. When unhappy customers have something to say, letting them vent their frustrations is an important aspect of providing effective customer service. Angry people often need to complain before they can get past their feelings, and may not be able to get focused on a situation until they have had their say. People often will not listen to anything that service providers have to say until they have been heard, so letting a difficult customer vent can actually be the key to making it possible for you to make progress toward resolving the situation. Cutting customers off without letting them have their say will likely be interpreted as disrespect, and can make an already difficult situation worse. Customers who are being difficult may become agitated in their demeanor. It is important for you to stay calm, reasonable and respectful yourself, no matter what. Do not allow yourself to react emotionally or defensively, being sure to keep your nonverbal messages neutral. Avoid nonverbal signs that could be construed as unwillingness to listen (such as refusing to make eye contact, crossing your arms, tapping your feet, etc.). Don't raise your voice or start talking too fast. Instead, keep your rate of speech at a steady, even pace. Keep in mind that customers who are being difficult often try to 'bait' service providers, hoping to get you to do or say something that you should not. There is often an underlying belief with angry or upset customers that they'll have leverage to get their way if they can get you to do or say something inappropriate. Don't give them the opportunity to try. Saying that you should let customers vent and maintain a respectful demeanor does not mean that you can't set limits or boundaries. In situations where customers become verbally abusive or threatening, directly communicate that the behavior cannot continue. Directly address the person by name, a technique that conveys to people who are angry or are being difficult that they have ownership of and responsibility for what they are doing and saying and establishes boundaries. To illustrate, you could say something like, "Mr. Doe, I really want to help you, but it is difficult for me to do so when you are speaking to me like this. I can help you resolve this. Will you let me help you?" The keys are to use the person's name, convey that you do have the ability to help, and phrase your request in a way that that person can't rationally say 'no' to. Chances are, Mr. Doe will not respond by saying, "No, I don't want you to help me. I would rather continue using inappropriate language." In order to help resolve difficult customer situations, you must first be sure that you understand them. When customers are upset, their language is often focused more on emotions than on describing the actual problems. Pay attention to what the customer is saying, listening closely enough to try to identify what the specific product or service related issues are, because those are the ones that you can directly assist with. Ask for clarification, saying things like "Can you tell me exactly what happened?" and "Tell me more about the situation." It's also important to use active listening techniques, which involve paraphrasing what customers have said to ensure that you understand and to steer the conversation toward relevant details. For example, you could say something like, "Let me be sure that I am clear on your request. What I think you would like to see is X, followed by A, B and C. Is that correct?" Once you are sure that you have a clear picture of the customers concerns, you can decide on the best way to handle it. From there, you should clarify what actions will be taken and who is responsible for doing what. Your goal should be to reach an understanding with the customer regarding what is going to happen next in terms of the situation at hand, then to clearly communicate what the organization will do and within what time frame. You should also clarify what the customer needs to do, in terms of the immediate situation and - if appropriate - how to stay out of similar situations moving forward. This interesting infographic, courtesy of FinancesOnline.com, has some interesting facts and figures about customer service. Providing effective customer service boils down to making a sincere commitment to putting the needs of those who do business with your company first. Taking on a customer-centric approach to customer service will go a long way toward helping you attract new customers while also keeping the ones that you have happy - which means they'll keep coming back to you time and time again.